OneTwoTrip.co.uk has chosen its top three destinations to bring in the New Year. It's never too late to plan your trip abroad during the festive season and with so many cities celebrating the turn of the year in style, OneTwoTrip.co.uk has chosen its top three destinations to bring in the New Year. So good they named it twice, New Year's Eve in New York is like no other. The main event in Times Square is broadcast live to millions of people around the world and is one of the most exciting cities to bring in the New Year. Join the one million people in Manhattan for a night to remember and then head to one of the many parties around the city. Return flights to New York from the UK, departing on 31 Dec are available from £452. The city of love turns into the city of celebrations on New Year's Eve when million of Parisians flock to the Champs Elysees to bring in the New Year. However, if you want to experience real Paris, book a table at one of the famous cabaret shows such as the Moulin Rouge and enjoy fabulous French food and a typical Parisian show. Return flights to Paris , departing on 31 Dec are available from just £87. Without doubt one of the most beautiful cities in the world, the Italian capital makes for a wonderful backdrop to your New Year's Eve celebrations. If you're looking for a party, head to one of the cities fabulous Piazza's. The Piazza del Popolo is a popular choice and offers a fantastic night of celebrations were you can enjoy live music, fireworks and of course fabulous Italian food. Return flights to Rome, departing on 31 Dec are available from just £152. For those who fancy celebrating closer to home, there is only one place to be. At midnight, Big Ben will ring out and the fireworks will light the skies. Bars and clubs throughout the city are packed full of party goers as the city celebrates the dawn of a new year. Return flights to London from around the UK, departing on 31 Dec are available from just £92. 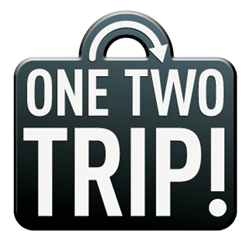 OneTwoTrip.co.uk is a new and innovative travel booking web site with a patented method of ticketing that saves the travel booker money and time. Launched in 2011, the web site already has millions of users globally, and presently has a team of just under 100 employees based in Europe, the USA and Russia. The OneTwoTrip.co.uk team believes that there is a lot more to be done to help travellers across the world to travel smarter, easier and faster. The best flight booking experience is just the start. The site is currently available in English, German, Spanish, Turkish, Azerbaijani, Russian and Ukrainian. London based Atomico VC (Founded by Niklas Zennström, the co-founder of Skype) invested in OneTwoTrip .co.uk in 2011 to stimulate international growth. OneTwoTrip.co.uk European headquarters are based in London, 12 Masons Avenue, EC2V 5BT.